For the second straight year, Bell has won RootMetrics’ Canadian Mobile Network Performance Review. Expanding from tests in three markets in 2014 — Montreal, Toronto and Vancouver — to eight in 2015, RootMetrics says that Bell’s combination of high network download and upload speeds, as well as comprehensive LTE coverage and reliability in every tested market, helped it retain its lead. What we wrote last year still applies: Using a six-tiered system focusing on overall performance (a combination of latency and average speed), top data speeds, reliability, call quality, data consistency (LTE vs. 3G), and SMS delivery speed, RootMetrics assembles a “RootScore” for each carrier in each city. This year, RootMetrics collected over 214,000 samples across 30,000 driven kilometres and 500 indoor locations. Rogers, Bell and Telus were tested in each of the eight cities, including Toronto, Montreal, Vancouver, Edmonton, Calgary, Ottawa, Quebec City, and Winnipeg, while Wind Mobile was tested in four active metros, and Videotron in its three. RootMetrics found that Bell’s speeds improved significantly over 2014 with the launch of its widely-marketed LTE Advanced network, while Rogers’ speeds dipped slightly over last year, most notably in Vancouver, Montreal and Vancouver. And while Telus’s median speeds were slower in nearly every market than Rogers or Bell, RootMetrics found that the telco gained markedly year over year, especially in its home market of Vancouver. 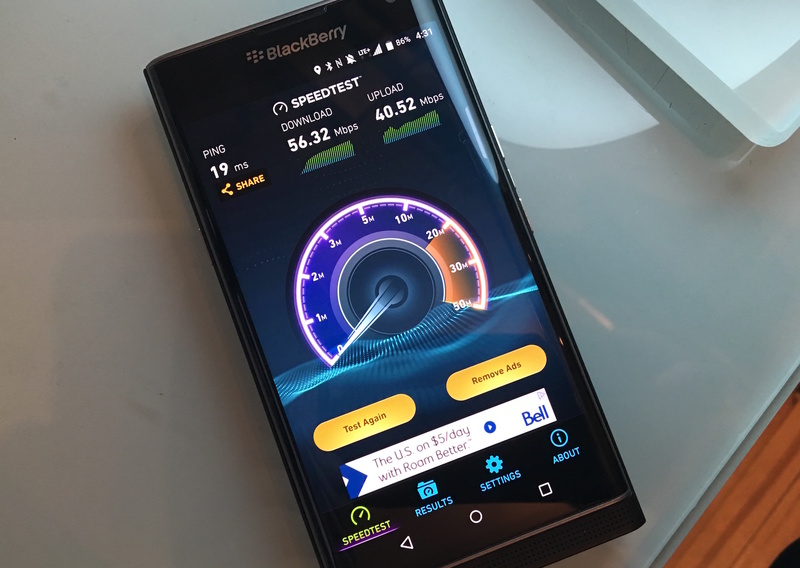 Bell’s median download speed 39.1Mbps in Toronto was slightly behind Rogers’ 41.8Mbps, but both were ahead of Telus’s fastest market of Montreal, at 29Mbps. 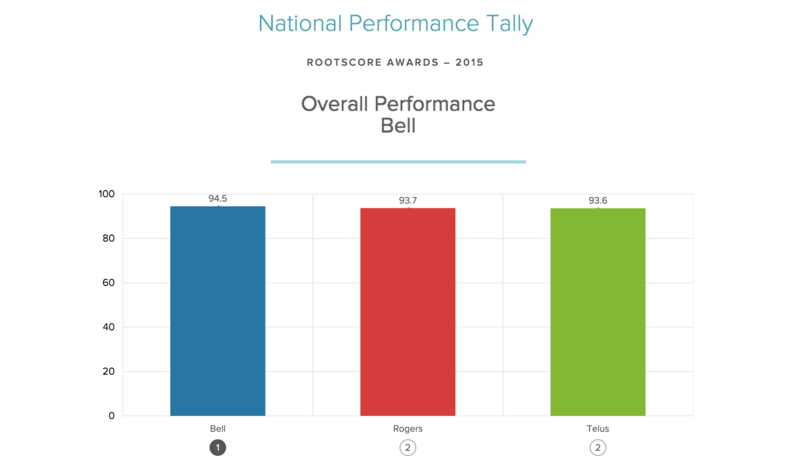 RootMetrics noted that Rogers had slightly higher LTE penetration than Bell or Telus throughout the country, though all three companies rated “Excellent” in every market for LTE, call and text reliability. 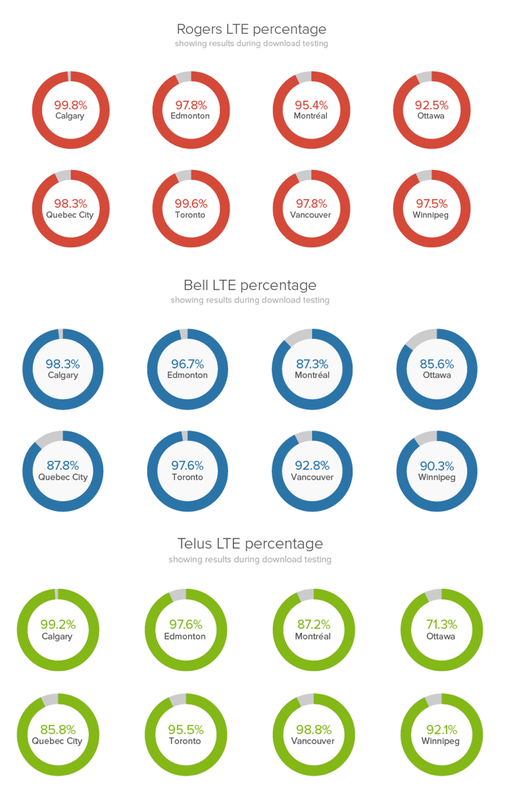 While Rogers scored above 95 percent LTE coverage in all but one city, Bell and Telus still have a lot of room to grow in certain provinces, especially Quebec and Eastern Ontario. “From a top-level perspective, Canadian speeds are some of the fastest among any cities we’ve tested, especially compared to similar-sized metros in other countries,” said Tim Newberg, head of business development at RootMetrics. He noted that independent of price, there are usually at least three, sometimes four, good choices for consumers in any given city. That fourth choice was one RootMetrics continues to focus on, albeit with some obvious omissions. The company included Wind Mobile for the second time in its cross-Canada report, testing it in Toronto, Vancouver, Edmonton and Calgary, as well as Videotron in Montreal, Quebec City and Ottawa. I asked Newberg why regional carrier MTS was not included in the Winnipeg testing, and he said it had to do with available resources, and would evaluate whether it would be possible to include it, along with SaskTel and Eastlink, in next year’s report. Videotron acted like an incumbent in its three evaluated markets, scoring median download speeds of 41Mbps in Montreal, beating out Bell and Telus across the country, with high LTE penetration in Montreal and Quebec City. RootMetrics noted that Videotron failed to impress for data reliability in Ottawa, though only by a narrow margin. 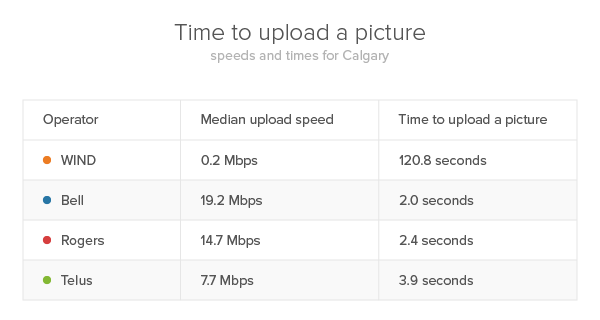 Finally, Wind Mobile continued to underperform, reaching a median download speed of 2.8Mbps in Toronto, where it has the most bandwidth; in Vancouver, where Wind has begun installing new equipment to replace its aging Huawei gear, the speeds were an even more paltry 1.8Mbps. “The differences in speed between WIND and the other networks can have a significant impact on your daily mobile life,” said RootMetrics’ Linder, who pointed out it would take 60 times longer on average to upload a 3MB photo on Wind than it would on Bell in most markets. With Wind launching its LTE in 2016, the company has a big hill to climb. Wind’s reliability increased over last year, at least in Calgary and Edmonton; maintaining a strong data connection proved difficult in Toronto and Vancouver, and the number of blocked calls — those that would simply not register with the network — was a troubling 5.7 percent in Toronto. Earlier this year, Bell won PCMags’ Fastest Canadian Network challenge, after tying with Rogers in 2014.